Angular CLI aka Command Line Interface is developed to get started quickly for building Angular apps, especially when the entire community felt that setting up Angular 2 development environment was cumbersome. 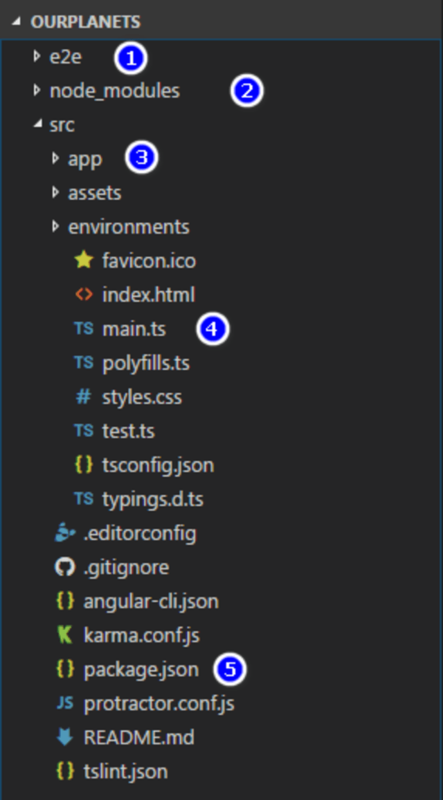 With introduction of Angular CLI, it’s now easier than ever to create, run builds, do E2E (end to end) tests, run apps and deploy Angular 2 application. In this article, I will build a very basic Angular application exclusively using CLI. So let’s started. What we will learn here? Installing Angular CLI using NPM. Examine CLI created project structure. Serve or Run Angular application. Create models and services to work with data. Ensure you have latest NPM and Node installed on your machine. After that run this command to install Angular CLI globally. 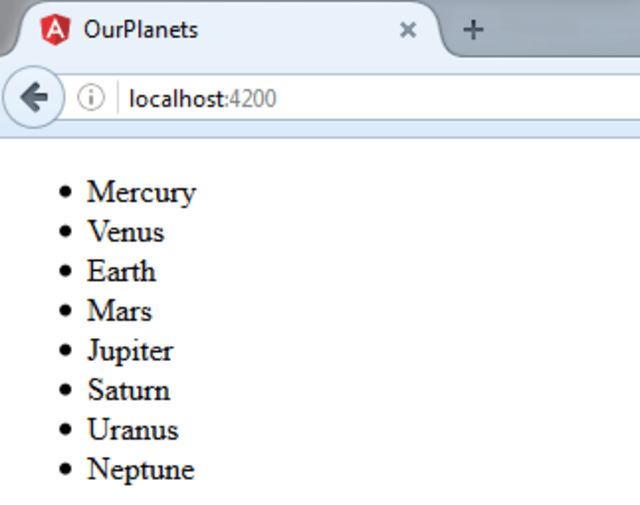 We will be creating a simple “OurPlanets“ application displaying list of our solar system planets Run the below command to create new Angular app. “OurPlanets“ is application name, the –prefix option tells us that “Planets“ will be added as prefix for project files. The newly created application is now GIT repository by default. As the package.json is already created, CLI command does restore of packages. It takes few minutes to restore packages. “e2e“ folder containing test files, configurations for performing end to end testing. 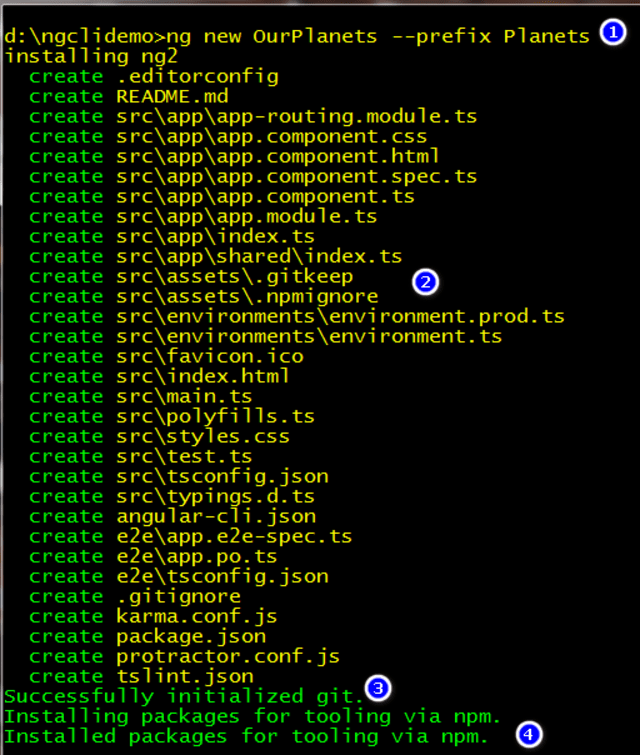 “src/“ folder is the main application development folder containing template HTML files, TS files, components. “packages.json“ contain essential file which contain reference to all packages needed for running Angular app. See .gitignore file also. Automatically “OurPlanets“ application is GIT repo, which we can push it if needed. Isn’t it amazing just by running “ng new” command of Angular 2 CLI gives us so much stuff to get started. Now that we have app with all dependencies, build it and run as shown in figure. Note: ng build command creates “dist/“, a folder containing compiled, minified (if applied) Angular application. Directly running ng serve will start webpack-dev-server to run application, this won’t create “dist“ folder. As “OurPlanets“ application is about solar system planets, it’s time to create model and service to get planets list and its details in form of planet. Model refers to class structure containing properties just like C#, Java. Run the following commands to create “planet.model” model class and “planet.service” service. Note: class generating command lets have suffix with ‘model’, service generating command creates file with ‘service’ suffix. Open planets.model.ts file & copy below code, its really simple class with four fields.